D seems to be following the exact same teething pattern as his sister (who had all of her baby teeth, including her two year molars, by sixteen months old). They both got their bottom two teeth at six months. E got six more at nine months, which is how old D is now. He currently has the top two in, but I can see the other two starting to break through. It makes for a quick, but painful time when they get teeth in rapid succession. 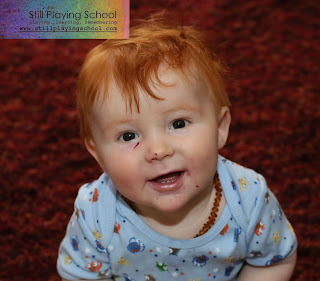 Paired with the fact that his red hair supposedly makes him more sensitive to pain, I was anxious to try a Baltic Amber teething necklace from Bouncy Baby Boutique. When trying to decide between a necklace and a bracelet, I read that the amber works best closer to the source of the pain. D wears his necklace during the day, but at night I wrap it twice around his ankle since it's safely tucked into his pajamas. My research also suggested amber in the color closest to the person's natural pigmentation, which wasn't hard to find for D through Bouncy Baby Boutique. His jewelry shipped fast (which is important if you are in a hurry to relieve teething pain) and it was packaged with instructions for care. We started wearing the amber on him after his first two teeth were already in. I have noticed a huge difference in his next few teeth coming through. I haven't had to give him as much ibuprofen this time and he is sleeping better. He is calmer and less clingy during the day, too. Is this a coincidence or the effect of the amber? It certainly doesn't hurt to have him in his cute accessory just in case! 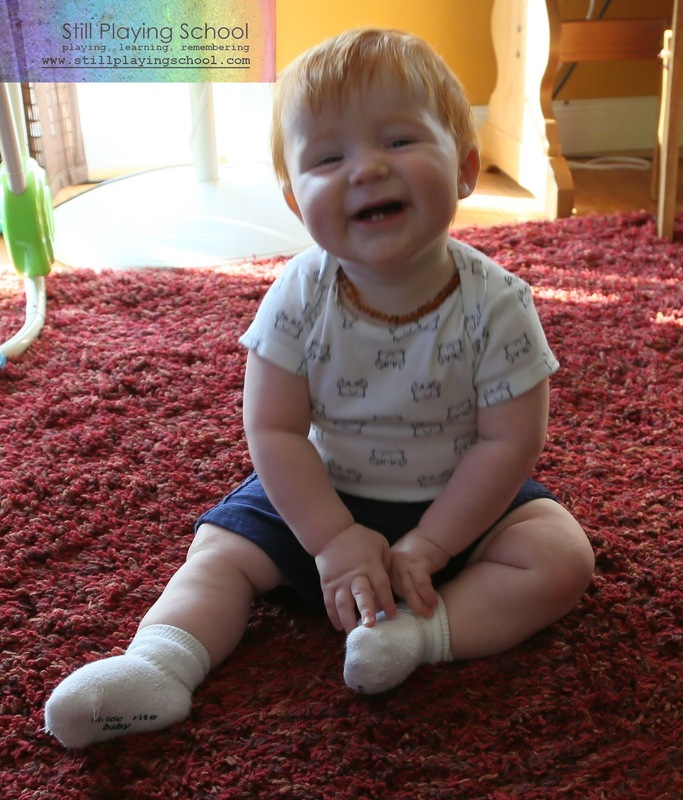 You can enter below to win your own Baltic Amber teething jewelry from Bouncy Baby Boutique! We received a baltic amber necklace in exchange for completing this review, but as always, all opinions and enthusiasm are 100% our own! Thank you for this information! We wanted to do it for McCartney but never did for some reason. I love the multi-color necklace, and they all are so pretty! I would love to try the Baltic lemon for my DD. she just turned 7 months and no teeth yet, but I know it won't be long! I think I'd try raw honey nuts. I've heard about these necklaces & wondered about how well they work! I've been curious about the amber for teething. We need one of these for Jonah. I haven't ordered one yet, and his first bottom tooth just popped through unexpectedly this week. I was surprised to see it. He didn't seem to have a difficult time, but in retrospect it does explain a few things. Maybe the Amber will make this second one come through easier. I like the Baroque Honey & Lemon colored one.